Shredder's Lair has a very diverse and unique team. The "SL ARMY" consists of Jesse Hotchkiss, Anthony Perkins, Joe Warr, Kevin Scott, and Mike "Chomp" Eckmann. Each one of the Shredders Army riders bring a different flavor of smooth, fast, and technical skateboarding for a diverse and extremely radical group! You guys are working on a full length video, right? We are currently in the works for THE ART OF SHREDDING shredders lair first full length DVD. 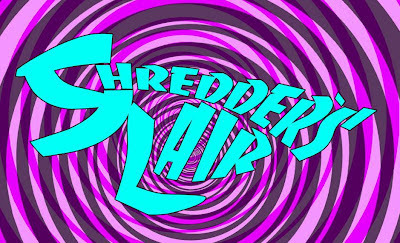 One more question, what does Shredder's Lair offer that's different from what other companies are doing? Shredder's Lair uses American made products. Our boards are pressed in Ontario, CA using the highest quality Canadian Hard Rock Maple veneers. Along with our high quality product we have a great team and staff that all bleed skateboarding and want to deliver the best product possible to ensure the shredding never stops! For more info. check out www.shredderslair.com.